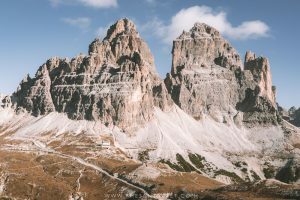 The Italian Dolomites are well known for their iconic sights – from the towering pinnacles of Tre Cime di Lavarado and razor-sharp peaks of Seceda, to the shimmering expanse of Lago di Braies and twisting mountain roads of Val Gardena. It’s one of the most spectacular corners of Europe, one that entices visitors to return again and again. And while lesser known spots like Lago di Sorapis may not fall on everyone’s Dolomites to-do list, its milky blue hue and dramatic backdrop of rugged cliffs surely make it one of the region’s most impressive sights. Arriving in late October, when the mesmerising colour of the lake was complemented beautifully by a vibrant cluster of auburn trees, I quickly realised though that there was a small surprise in store – there was very little water left in the lake. Fed by the swollen streams of melting snow that flood Lago do Sorapis over spring and summer, my arrival so late in the year meant all but a small pocket of the enormous lake was unfortunately dried up. 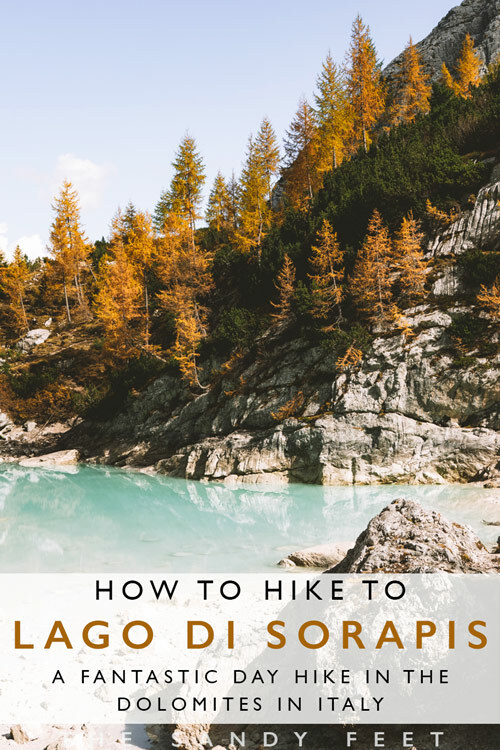 Still, the area was beautiful to explore, and if you’re visiting during the warmer months of the year when the outrageously blue water sprawls across the basin, the hike to Lago di Sorapis makes one of the best day hikes in the Dolomites. The trail begins at Passo Tre Croci about halfway along the road between Cortina and Misurina. You’ll find plenty of parking space alongside the main road and a bus stop for those arriving by public transport. As one of the prettiest and most accessible trails in the area though, it can become incredibly busy in summer so be sure to arrive early to nab a spot and enjoy the trail without the crowds. Along the roadside, horses graze in a dewy meadow, sun streams across the jagged peaks and the changing trees hide the hiking trails beyond – it’s an impossibly picturesque scene to begin the hike to Lago di Sorapis. At the far end of the field, the path is clearly marked and weaves gently uphill through pine trees and across the odd river beneath the rugged cliff line. Gaps in the dense foliage offer glimpses of the spires of Tre Cime di Lavaredo in the distance and the verdant Misurina Valley. Emerging from the forest, the path clings tightly to the cliff’s edge and it’s a long way down – if you suffer from vertigo or a fear of heights, this section may be a little unnerving. Metal ladders and stairs replace the spongy forest floor and things begin to get a little more tricky. There’s some clambering over uneven rocky terrain and shimmying up small ladders before the trail winds back toward the shelter of the forest. And then, at the very last moment, Lago di Sorapis is revealed all at once. A serene pool of milky blue wrapped in spiky larches in the throes of autumn. Beyond, a ragged pinnacle of rock pierces the cobalt sky amidst the imposing cliffs that shield the scene from the low October sun. Like many other spectacular spots in the Dolomites, this dreamy spot beside Lago di Sorapis has become something of an obsession for many a photographer and has since gained enormous popularity on Instagram, and it’s not hard to see why. Brushed in rich amber and brilliant blue, it is an impossibly beautiful picture to take in, but it was also immediately clear that, as beautiful as autumn is here, it’s not exactly the best time to visit this particular lake when very little water remains. As I discovered, the best time to visit Lago di Sorapis is during spring and summer when the lake is at its fullest. After, spending some time enjoying the area, simply return via the same route back to the main road. The hike is 11km return and takes around 2 to 3 hours each way. Setting off from Cortina earlier that morning with the first glimmer of sun just beginning to wash across the highest peaks, I had envisaged spending most of the day beside the glimmering expanse of Lago di Sorapis – relaxing beneath the fiery autumn trees and picnicking lakeside in the sun. Just my kind of mountain bliss. Arriving to see that, for the most part, the lake had dried up, I quickly decided on a change of plans. Pouring over my map, I saw another trail leading away from the lake, one that traversed the Cadin del Laudo valley and rambled alongside the forest before winding steeply down into Cortina. It would mean adding a considerable distance to the hike, a seriously steep climb up and down and no real way of knowing what I would find along the way. 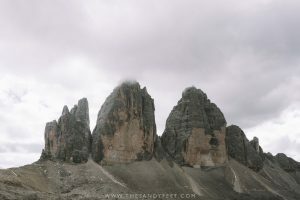 As it turns out, this spontaneous decision would become the most incredible hike I did in the Dolomites. Also one of the most challenging hikes I’ve ever done, sure, but absolutely worth it! This alternate route is 12 km from Lago di Sorapis to Cortina, (or just 7 rather challenging kilometres if you backtrack to Passo Tre Croci) and took me around 5 hours to complete with some very slow going on the steep downhill sections. In hindsight, it was perhaps not a hike I should have attempted solo, especially with so little preparation. The terrain was rough and passed through a rather remote corner of the mountains where I encountered just one other hiker along the entire route. It also took far longer than I had expected which led to me running like a madwoman through the last section of forest as darkness washed through the trees and I attempted to keep any thoughts of wolves and bears far from my mind. That said, it’s a spectacular trail and, if you’re up for the challenge, it makes a fantastic alternate hiking route from Lago di Sorapis. From the lake, simply follow the same path out for around 700 m. Inside the forest you’ll find a signposted intersection with a path leading off to the left. This immediately turns steeply upwards for about 1.5 km and is quite a slow scramble over loose rocks and uneven terrain to reach the top from where the path zigzags downward and across a wide basin to the ridgeline. The trickiest part of the hike comes once you reach the saddle – 200 m of insanely steep rubble, no clear path and very little to hold onto. Even if you don’t normally hike with trekking poles, you’ll want them for this short but brutal stretch, or at the very least, a makeshift walking stick from a fallen branch. At the bottom awaits one of the most spectacular views I’ve ever seen – naked peaks rising sharply from an ocean of forest speckled with vibrant autumnal yellow awash with golden afternoon light. It’s like the opening scenes of the Lion King brought to life. From here, there is the option to return to Passo Tre Croci, otherwise, continue along the trail that winds between the towering massif and the forests toward the Rifugio Faloria and the Faloria Cable Car Station with its spectacular backdrop of mountain peaks. 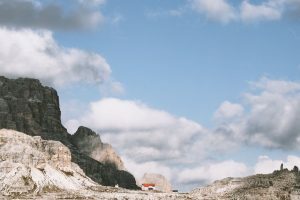 If you’re visiting in summer (June through September), you can stop in at the Rifugio Faloria for a well-deserved break and take the cable car the rest of the way down to Cortina. Out of season, your only option is to continue down the incredibly steep trail which begins with a very rocky zigzag which is not all that pleasant, but soon enough evens out to a gentle downhill slope which weaves through the forest for several kilometres until you emerge on the outskirts of Cortina. Rifugio Vandelli | Set right behind the lake, Rifugio Vandelli is in a simply perfect location, especially if you’re a photographer wanting to catch the first glimmer of light on the water. Prices begin at €13/€26 for members/non-members with the option for half board or a la carte dining. Read the latest reviews on TripAdvisor, or further information check here. Aside from the Rifugio, the best place to base yourself is in Cortina. If you’re visiting in high season, be sure to book well in advance as this picturesque town is a firm favourite in the Dolomites. Hotel Olimpia | This comfortable, budget-friendly hotel is located right in the heart of town and just a 2-minute walk from the bus station. The free breakfast here was great and the staff were wonderfully accommodating when my plans were chopped and changed from one day to the next. Rooms are often discounted out of season. Read the latest reviews on TripAdvisor, or check rates and availability on Booking.com. Hotel Montana | Another pleasant budget-friendly option in Cortina, Hotel Montana sits right on the main pedestrian thoroughfare and offers colourful rooms and a free breakfast. 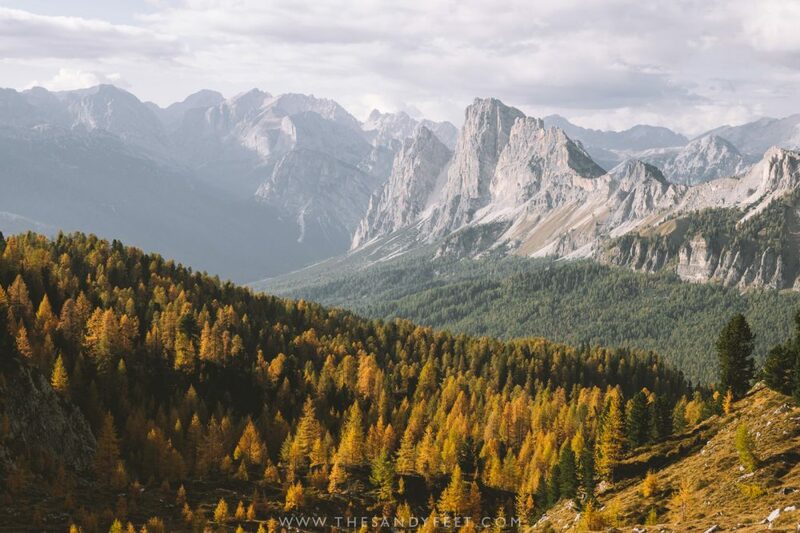 Car | By far the easiest way to travel in the Dolomites and to reach the Lago di Sorapis trailhead is by car from Cortina d’Ampezzo which is just a 15-minute drive from the Passo Tre Croci parking area. Search the best deals on Car Rental in the Dolomites here. Bus | From June to early September, bus 30/31 runs from Cortina’s central bus station to Rifugio Auronzo via Passo Tre Croci just four times a day. Check at the very helpful information centre in Cortina for the exact departure times and seasonal dates, or look on Dolomiti Bus once the summer schedule has been released. If you choose to take the alternate route, I’d recommend taking the bus to the trailhead rather than driving so you don’t have to worry about picking up your car afterwards. Hike | If like me, you happen to arrive well out of season when the summer buses have long since stopped running and you’re not able to rent a car, then the only other option is really to hike. The trailhead for Lago di Sorapis sits just 7 km from Cortina and can be reached in around 1.5 hours at a good pace either by following the road or taking forest trail. Bear in mind that if you have to use this option and are intending to hike the alternate route back, it quickly adds up to a hefty 25km day with over 1,000m altitude change. Cable Car | If you are visiting in summer and planning to take the alternate route, you could also do the hike in reverse, starting by taking the Faloria Cable Car from Cortina to Refugio Faloria and then following the trail all the way to Lago di Sorapis. From there, hike the standard route back to Passo Tre Croci and either catch the bus or hike back to Cortina. Solid Hiking Boots | Particularly if you’re taking the stunning alternate route, there are some incredibly steep and rocky sections where a pair of sturdy hiking boots are absolutely essential. I travel with and love these SCARPA Gore-Tex Boots which are wonderfully lightweight, durable and waterproof. A Reusable Water Bottle | No need to buy any plastic bottles out here! Bring a water bottle that can be used for the duration of your trip and fill up before heading out. This bottle from Klean Kanteen is my go-to. A Waterproof Jacket | In the mountains, the weather can turn at the drop of a hat. Though I had nothing but beautiful sunshine during my visit, it’s always worth taking some wet weather gear and a thin base layer, just in case. Band-Aids | Haven’t worn in your boots yet? The steep uphill and downhill sections mean your shoes will constantly be rubbing against your heel and an uncomfortable blister could very well ruin your hike. Trekking Poles | So, I haven’t quite joined the ranks of avid hikers to the point where I’ve ever considered needing trekking poles, but the challenging downhills sections on the alternative route definitely made me wish I had them. If not to stop myself from skiing down a wall of loose scree, then at least to take the pressure off my knees (do I sound like a crotchety old person yet!). These trekking poles from Black Diamond come highly recommended online. A Reliable Map | Whether its the foldaway paper kind or one you can scroll through on your phone, a reliable map is an absolute essential for hiking in the mountains – especially if you’re taking the alternate route. As always, I used Maps.Me for the hike and was incredibly thankful I had it. If you’re relying on your phone, be sure it’s fully charged or add a powerpack to your backpack. Snacks | During summer, you can get food from Rifugio Vandelli, but it’s a good idea to bring snacks for the hike as well, especially if you’re taking the longer route. Fruit, nuts, crackers and candy are all a good idea and available at the fairly well stocked Kanguro supermarket in Cortina!